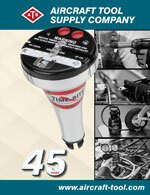 Aircraft Tool Supply has been serving the aviation industry since 1974. We carry a wide selection of sheet metal tools, riveting products, inspection equipment, and aircraft engine maintenance tools to meet the needs of everyone from the homebuilder to the maintenance professional. Most of the aviation tools in our product line are housed and distributed from our 20,000 square foot plant located in the northern lower part of Michigan near the sandy shores of Lake Huron. ATS branded items include: pilot cutters, strap duplicators, rivet sets, rivet guns, rivet squeezers, dimple dies, bucking bars and many other products. We also distribute a wide variety of products from major manufacturers such as Champion, Cherry-Textron, Meyer Hydraulic, Sioux, 3M, Tennsmith, PRC DeSoto (Semco), General, and GBP. In all, we offer over 3,000 different products for aircraft and/or general maintenance. We have a full one-year warranty on all of our products unless otherwise specified, and an unconditional 30-day money back guarantee on everything we sell. If you are not satisfied with any of our products, simply return it within 30 day for a full refund with no questions asked. Our aim is to provide outstanding service and quality aviation tools at a reasonable price. To this end, we are constantly looking for ways to meet the needs of our customers. Your input is very valuable to us and we encourage you to send us your comments. Call (800) 248-0638, or email us at info@aircraft-tool.com and let us know how we can better serve you.